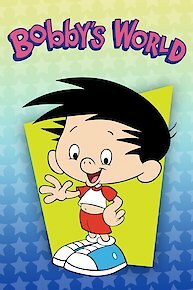 Bobby's World is a show that provides comedic relief and a look inside the mind of a four year old Bobby Generic which is an alter ego of American-Canadian actor and comedian Howie Mandel. Bobby lives with his family is a generic suburban neighborhood but the show takes viewers inside his imagination where they will see a variety of adventure and things only the imagination of a four year old would possess. Filled with laughs and a perspective of his four year old brain, viewers will follow family situations and problems that are important to little Bobby. Howie Mandel shows off his comedic talent by introducing each episode in live action as well. Starting at the beginning of each episode Howie will begin telling a joke or two, about his personal experience and how Bobby will be able to deal with his own adventures in the episode of the day. Bobby has two traits that stick out in his life, which are his knack for taking things to literal and letting his imagination go wild and also getting the best of him. His best friend and his security blanket that he will not go anywhere without is also his stuffed spider Webbly. Webbly has a variety of functions that play into the imagination of young Bobby. Bobby's family is consistent of his dad, Howie who is a businessman who is trying his hardest to be a good father but still struggles with family and communicating effectively. Bobby's mother Martha is a full time Mom who tries to stay calm and be the best mother she can be to Bobby and his siblings Kelly, Derek and the family dog Roger. Bobby's World originally aired on FOX kids in 1990 and ran for a total of eight seasons until its end in 1998. Bobby gets into trouble and gets "triple" punishment from his dad. Bobby has the blues because he is too young to play with Kelly and Derek and their friends. Bobby tries to figure out what to get his dad for Father's Day. The family goes on a cruise and Bobby learns a lesson about practical jokes. Bobby learns about the importance of Thanksgiving. Bobby learns a lesson about keeping his word. Bobby is worried that he has come down with a terrible desease: the cooties. Bobby thinks that Roger is kidnapped and held for ransom. Bobby learns about the importance of manners. Bobby tries to be independent and wants to get a buzz cut for the 4th of July. Bobby wants desperately to read Kelly's diary. Bobby runs for class president. Bobby tries to be independent and wants to get a buzz cut for the Fourth of July. Bobby learns the concept of time. Uncle Ted takes the kids on a ski trip. Bobby thinks that Uncle Ted is lonely and tries to find him a wife. Bobby learns the meaning of Christmas. Bobby has to do chores to earn money to buy the X-15 Super Saturating Soaker Hose. Bobby discovers that he is good at playing caps. A university professor tells Bobby that he is a genius. The Generic family gets a computer and chaos ensues. Bobby's World is currently available to watch and stream on FOX. You can also buy, rent Bobby's World on demand at Amazon Prime, Amazon online.